The Singapore summit between Kim Jong-un and Donald Trump has all the drama of a Hollywood production, including glimpses the world is getting of the entourage travelling with the North Korean leader. One of the most visually striking elements of this entourage has been Kim’s phalanx of bodyguards. On first thought, one is reminded of another authoritarian leader whose bodyguards also inspired curiosity. 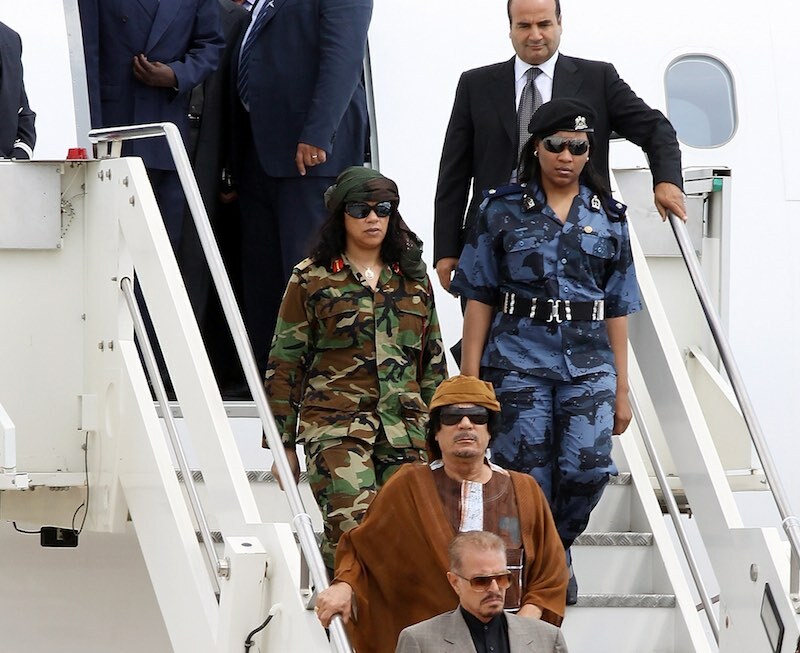 Muammar Gaddafi, the late ruler of Libya, also travelled with a large security detail consisting near entirely of women of the 77 Brigade dressed in a military uniform adapted to suit his tastes. There were no surprises that after Gaddafi’s fall these women were found to be anything but free. The ostensible glamour of the unit was found to hide a litany of abuse, intimidation, and violence that ensured they followed Gaddafi’s every order. We don’t know how free Kim’s bodyguards are, or whether because of cradle-to-the-grave indoctrination they have any idea what personal freedom entails. We do know that Kim’s bodyguards are not given an option to decline service, as well as some other details about their selection and training. Joseph Bermudez covered some of this in his book Shield of the Great Leader: The Armed Forces of North Korea, particularly the chapter on intelligence and internal security forces. The men jogging beside Kim’s car, like so many regimented henchmen from a spy drama or sci-fi characters out of the Matrix movie franchise, have been subject to intense security-vetting procedures. These men must be of a similar height to the Supreme Leader, and some are possibly part of Kim’s greater family. As would be expected, they are trained in close personal protection techniques, weapons, martial arts, fitness, and to be a last-resort human shield. Even if we thought that their steady jog beside Kim’s limousine would cause them to have a “wobbly” aim (if they had handguns), their fitness and martial arts prowess would cause any would-be assailant significant problems. Singapore is only about 350 kilometres away from Kuala Lumpur, where many believe the Supreme Leader had his brother Kim Jong-nam murdered early last year. Kim’s security detachment, operating on a belief that others act in as cold-blooded a manner as themselves, will leave nothing to chance. Although they do bear a resemblance to the US Secret Service detail that protects Trump, or even Australia’s own close protection unit who protect the Prime Minister, there is probably within the North Korean security detail an almost messianic devotion to Kim Jong-un. While we think of North Korea as a brutal communist dictatorship, and we know the grim 2014 findings of Justice Michael Kirby on that country, the ideology of the North known as Juche more closely resembles religious fundamentalism. Juche is essentially a personality cult in which Kim Jong-un, like his father and grandfather, is a figure the population must treat as a demigod. While the US Secret Service and North Koreans have short haircuts, wear suits, sunglasses and, in the case of the Americans, carry sophisticated communications technology, the ideology prevalent in the North Koreans suggests a chasm of difference in outlook to their American counterparts. It is possible that the North Korean adherence to Juche would see a remarkable response should Kim the “demigod” be subject to a threat or actual attack.